Vista Smart Security 2010 is a rogue antispyware program, which is a new clone of Antivirus Vista 2010. The fake security program distributed with the help of trojans. Vista Smart Security 2010 reports false infections and displays a lot of fake warnings to scare user into purchasing full version of the software. 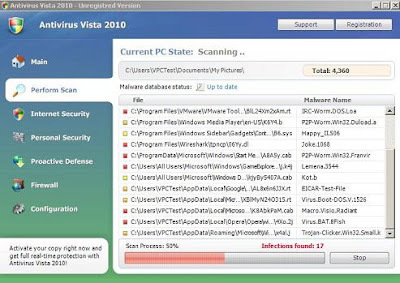 If your computer is infected with this malware then use the Vista Smart Security 2010 removal instructions.